Welcome to the Richter Library's Guide to Psychology! Provided by AP Image Archive. 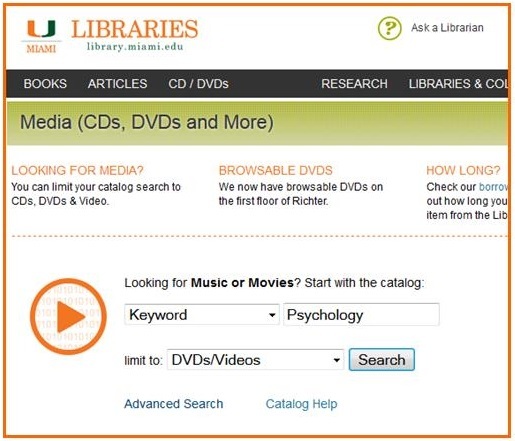 Hello all, and welcome to the University of Miami Libraries' Guide to Psychology! The purpose of this guide is to help you navigate through the many psychology-related resources available to you through the University of Miami Libraries system. Full-text book reviews featuring current scholarly and professional books in psychology. Includes reviews from a psychological perspective of popular films and trade books from 1956 through 2017. Are you looking for Psychology books? The Richter library is organized in the Library of Congress Classification System, which means each subject is grouped and assigned a letter and number range. For Psychology, look for the BF section. The R section also contains relevant Psychology books, pertaining to mental health. Too general? Try doing a Subject search in IBISWEB to narrow down the results. For example, once in IBISWEB, set the drop menu to "Subject" and enter your Subject Term. If you're looking for the psychology of women, enter "Women Psychology". IBISWEB will sort and organize the results for you into topics. For more on the Library of Congress Classification System, take a look at the Library of Congress Classification Outline. The DSM-5 is a manual published by the American Psychiatric Association and covers all mental health disorders for both children and adults. The DSM-5 has recently been released. More DSM-5 materials will be listed on this page as they become available to the library. DSM-IV titles will remain until that time. The DSM-5 also lists known causes of these disorders, statistics in terms of gender, age at onset, and prognosis as well as some research concerning the optimal treatment approaches. 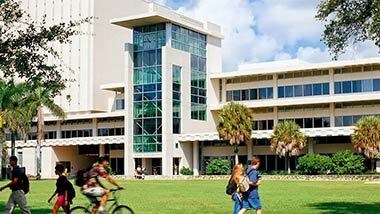 The University of Miami Libraries provides multiple sources of access to this resource. Database of over 24,000 chapters in PDF format from over 1,500 books published by APA and other publishers. Includes over 800 classic books of historical impact in psychology. Provides access to over 100,000 academic titles across many disciplines. Books may be viewed online using the ebrary reader. Many titles are also available to download for reading offline. Users will be prompted to create / log in to their own ebrary account to access the download functionality. Windows and Mac users will use Adobe Digital Editions to view the downloaded titles (freely available at "http://www.adobe.com/products/digitaleditions/#download"). iPad users will use the Bluefire Reader app to view the downloaded titles. The National Academy Press is a searchable multidisciplinary digital library of full-text book length research studies and policy reports by leading experts in their fields. Hundreds of titles are available in PDF or HTML format. Readers are able to search the full-text of one or all publications; search all titles; browse by subject category. Written by well-known scholars and clinicians, this impressive reference covers all areas of clinical psychology. The first four volumes address large domains: volumes 1 and 2 describe the historical, theoretical, and scientific foundations and professional issues; volume 3 explores the role of research; volume 4 looks at assessment. Clinicians will find volume 4 particularly useful for its range of assessment strategies (memory, learning, behavioral, legal, forensic, etc.) and excellent scholarly reviews of the breadth and gaps in knowledge of assessment. Some chapters would be enhanced by a case study, clinical summary, or discussion of risk factors or assessment complications. This encyclopedia is an excellent general guide to applied psychology. Its 300 articles range from "Academic Failure, Prevention of," through "Cognitive Aging" and "Personality Assessment," to "Youth, Employment of." The signed articles, arranged alphabetically, examine both the theoretical bases of their subjects and the application of theory and research to practical problems. The Encyclopedia of Health Psychology offers students, researchers, and practitioners a comprehensive reference for understanding the behavioral, emotional, and social influences on health. Featuring over 200 entries from more than 150 leading practitioners, researchers, and educators, it provides the extensive, accessible, and current coverage that this multidisciplinary field requires. This is also available via PsycBOOKS! This joint effort of the American Psychological Association and Oxford University Press has more than 1,500 alphabetically arranged, signed entries, including nearly 400 biographies. Eight years in the works, it was edited by Alan E. Kazdin (psychology, Yale) and reflects the efforts of some 1,400 contributors. A veritable who's who in psychology and its related disciplines forms the panel of editors and writers. The MIT Encyclopedia of the Cognitive Sciences (MITECS) is a landmark, comprehensive reference work that represents the methodological and theoretical diversity of this changing field. At the core of the encyclopedia are 471 concise entries, from Acquisition and Adaptationism to Wundt and X-bar Theory. Covering anatomy, physiology, neuropsychology, clinical neurology, neuropharmacology, evolutionary biology, genetics, and behavioral science, this four-volume encyclopedia contains over 200 peer reviewed signed articles from experts around the world. The Encyclopedia articles range in size from 5-30 printed pages each, and contain a definition paragraph, glossary, outline, and suggested readings, in addition to the body of the article. The first five contributions examine the justification and methods of the field, as well as current controversial issues. Groups of papers dealing with evolutionary psychology's treatments of survival, mating, parenting and kinship, and group living follow. Next come six papers exploring the contributions evolutionary psychology can make to current psychological disciplines and two chapters on the connections between evolutionary psychology and the fields of law and literature. The work concludes with an afterword by evolutionary biologist Richard Dawkins, whose ideas have influenced the field of evolutionary psychology. This handbook presents a thorough, scholarly overview of the psychology of racial, ethnic, and minority issues in the United States. It covers the breadth of psychology viewed through the lens of the racial and ethnic minority experience. Cognition, mind, counseling psychology, lesson plans, learning styles, and Vygotsky are just a few of the many subjects discussed in this exciting work. This work, a rethinking of the field of school psychology, will be an essential resource for anyone interested in teaching and learning. A key feature is the introductory background article in part 1, with an overview of the whole field. Part 2 is a very helpful set of 22 "Road Maps" to enable readers to look for the articles in part 3 that are most relevant to their special interests, e.g., vision, psychology, or artificial intelligence. The Merck Manual is organized, like most internal medicine textbooks, into organ systems, such as heart, lungs, gastrointestinal system, muscular system, etc., dealing with each major disease of that system in turn, in the standard format of diagnosis (symptoms), prognosis and treatment. Looking for Psychology journals? Below are lists of some of the most frequently used journals in the subject area of Psychology. The following databases provide information in the health sciences, including arts and health professionals. A source for full-text, peer-reviewed scholarly and scientific articles in psychology. An abstract and citation database of peer-reviewed literature, including scientific journals, books and conference proceedings, covering research topics across all scientific and technical disciplines, ranging from medicine and social sciences to arts and humanities. Provides abstracts and listings of peer-reviewed articles, in-press publications and conferences covering international biomedical literature from 1947 to the present day. It includes full-text indexing of drug, disease and medical device data and uses Embase thesauru,s Emtree, which facilitates precise searching. Essential for education researchers of all kinds, it features journals included in the Current Index of Journals in Education and Resources in Education Index. It also includes records for books, conference papers, curriculum guides, policy papers and more. Provides research on "cognitive, behavioural and other treatments for psychological problems and issues occurring as a consequence of acquired brain impairment (ABI). These studies are rated for their methodological quality, evaluating various aspects of scientific rigour." Indexes international literature of sports medicine, exercise physiology, sports psychology, training, nutrition, coaching, sociology of sports, and related topics. Also covers recreation, games, play, and dance. Don't see what you need in the Core Psychology Databases section? Psychology topics can cross a wide variety of disciplines. Check out these databases for further help. You can also use databases in other subject areas to help you find what you need. Just use the drop menu on the Databases page to navigate to the subject you prefer. Looking for journal impact factors? Look no further! Citation Indexes can be found here. Use these codes to help narrow your searches to particular fields of interest. These are especially helpful if you would just like to browse certain sub-fields or topics. This guide explains what all of the database field codes mean. This guide explains what each methodology means. For example, it will tell you that an empirical study is a study based on facts, systematic observation, or experiment, rather than theory or general philosophical principle. "Evidence-based practice is the integration of the best available research with clinical expertise in the context of patient characteristics, culture and preferences." "The purpose of EBPP is to promote effective psychological practice and enhance public health by applying empirically supported principles of psychological assessment, case formulation, therapeutic relationship, and intervention." The APA's Policy Statement identifies eight "competencies that promote positive therapeutic outcomes". Conducting assessments and developing diagnostic judgments, systematic case formulations, and treatment plans. Making clinical decisions, implementing treatments, and monitoring patient progress. Possessing and using interpersonal expertise, including the formation of therapeutic alliances. Continuing to self-reflect and acquire professional skills. Evaluating and using research evidence in both basic and applied psychological science. Understanding the influence of individual, cultural, and contextual differences on treatment. Seeking available resources (e.g., consultation, adjunctive or alternative services) as needed. Having a cogent rationale for clinical strategies. Collection of health databases providing independent evidence to inform clinical treatment decisions and other health related decisions. Evidence-based practice is the integration of the best available research with clinical expertise in the context of patient characteristics, culture and preferences. Need some videos and documentaries on psychological topics? From the catalog, leave the first drop menu on "Keyword". Set the second drop menu to "DVD's/Videos". Click "Search". A list of DVD's related to Psychology will appear. Looking for the APA's Systems of Psychotherapy Series? Look no further! From the APA: "The APA Psychotherapy Video Series presents distinguished psychologists demonstrating specific approaches to a wide range of patient problems. Designed for clinical training and continuing education, these videos and DVDs were created to provide psychology students and practitioners with expert introductions to various therapeutic approaches and hands-on knowledge of how to treat particular patient issues." Formerly Digital Dissertations Online: A listing of doctoral dissertations in all subject areas completed at U. S. accredited institutions, with some Masterâ€™s theses and foreign dissertations. Contains full-text theses and dissertations from colleges and universities around the world. The Networked Digital Library of Theses and Dissertations (NDLTD) is an international organization dedicated to promoting the adoption, creation, use, dissemination and preservation of electronic analogues to the traditional paper-based theses and dissertations. "The University of Miami Graduate School Collection contains over 4000 dissertations and theses created between 1961 and the present. The Graduate School supports masters-level and doctoral programs on the Coral Gables campus, at the Miller School of Medicine, and at the Rosenstiel School of Marine ant Atmospheric Science." Under "Material Type", select "UM Theses"
Contact the Department of Special Collections to locate masters theses. The Agency for Healthcare Research and Quality (AHRQ) publishes evidence-based information on health care outcomes; quality; and cost, use, and access. A part of the Centers for Disease Control,this site provides links to a wide variety of reports and numeric public health data. Topics include chronic diseases, communicable diseases, environmental health, health practice and prevention, injury prevention, and occupational health. The National Center for PTSD (NCPTSD) aims to advance the clinical care and social welfare of U.S. Veterans through research, education and training on PTSD and stress-related disorders. The NIMH is the largest scientific organization in the world dedicated to research focused on the understanding, treatment, and prevention of mental disorders and the promotion of mental health. This site includes statistics and information on specific mental health topics, as well as information on research funding and clinical trials. The SAMHSA Health Information Network (SHIN) includes the National Clearinghouse for Alcohol and Drug Information (NCADI) and the National Mental Health Information Center (NMHIC) . SHIN connects the behavioral health workforce and the general public to the latest information on the prevention and treatment of mental and substance use disorders. SEER is a program of the National Cancer Institute. Statistics available from this site include tables, graphs and maps of cancer incidence, mortality, prevalence, and the probability of developing or dying from cancer. American Community Survey (ACS) The premier source for detailed information about the American people and workforce. A source for internationally comparable statistics on education, science and technology, culture, and communication for more than 200 countries and territories. The Bureau of Labor Statistics (BLS) is the principal fact-finding agency for the Federal Government in the broad field of labor economics and statistics. Need to find a test or or know more about one? This APA guide provides information about 3 topics: published psychological tests, unpublished psychological tests, and additional information on the proper use of tests. Provides descriptions of tests, manuals, rating scales and other instruments used in the health fields, psycho social sciences, organizational behavior, education, and library and information science. The service contains primary and secondary material, such as checklists, interview schedules, rating and other scales, coding schemes, and projective techniques. Guide to information about 2,000 testing resources (not the test or instrument itself) in psychology, education, business, and leadership. 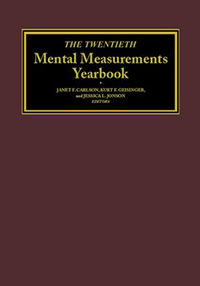 Volumes in the MMY series are produced every 3 years - most is the 20th ed. 2017. Type the number 20 in the first search box of this online resource. Richter also has the print, as noted far right column of this page. Looking for Psychological Tests? The Richter Library carries some tests and measurement tools. For a particular type of test, e.g., personality test, type the words in the main search box on the Libraries' home page. On the results page, left hand side, use Refine My Results to narrow the results to improve relevancy. The British Psychological Society's research blog. An older site with links to many different psychological tests. Provides links to psychological research experiments available online. A public health agency in U.S. Department of Health and Human Services to advance the behavioral health of the nation. SAMHSA's mission is to reduce the impact of substance abuse and mental illness on America's communities. APA's online resources for students. Comprehensive site of psychology-related information for students. The psychology national honor society. Links to all of the APA divisions by number and name or topic. RSS is a protocol that lets users subscribe to online content using a"reader" or "aggregator." Internet users tend to settle on preferredinformation sources. RSS allows users to create a list of those sourcesin an application that automatically retrieves updates, saving usersconsiderable time and effort. Please see the RSS Feeds Guide. Ideas - and the words that express them - can belong to people. So when you use someone else's words and ideas, especially in your essays and written assignments, you have to tell people where you got your ideas and quotes from. If you don't cite your sources, it's considered a type of stealing. Don't be an idea thief! Use the links and videos on this page to learn what plagiarism is, and why your professors don't want you to do it. What is Plagiarism? An interactive game and guide from Rutgers University. Avoiding Plagiarism. A guide provided by the Purdue OWL. The Writer's Handbook to Avoiding Plagiarism. By the University of Wisconsin Writing Center. The library has copies of the Publication Manual of the American Psychological Association (a.k.a. the APA Citation Manual). 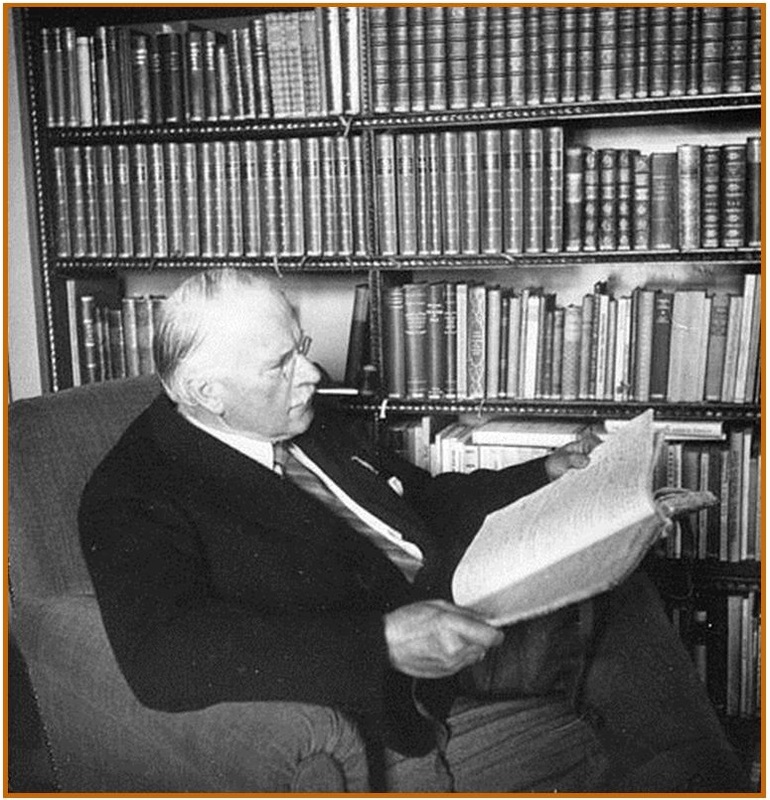 Current editions are held in our reference collection, call number: BF76.7 .P83 2010 . An additional copy is kept at the Information and Research Assistance Desk on the 1st floor of Richter Library. Need help writing your essay? Make an appointment with UM's writing center!